An explosion blew out the walls of an unfinished power plant in Connecticut and set off a fire during a test of natural gas lines Sunday, killing at least five workers, injuring a dozen or more, and leaving crews picking through debris for more possible victims. At least 12 people were injured in the explosion at the Kleen Energy Systems plant in Middletown, about 20 miles south of Hartford. Crews with dogs were searching for the victims among the rubble till night. It was not clear how many people, if any, remained buried. Deputy Fire Marshal Al Santostefano told the reporters that 50 to 60 people were in the area at the time of the explosion, but authorities said multiple contractors were working on the project, making it difficult to know how many people were missing. "I think a majority of them did survive," Santostefano said. "Most of them did walk away." 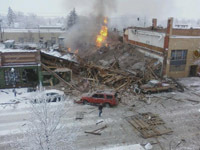 The explosion happened about 11:17 a.m., he said. Mayor Sebastian Giuliano called it a gas explosion but said the exact cause was not immediately clear. The search was focusing in part on who was at the plant during the blast. Giuliano said 100 to 200 workers would have been there on a typical weekday. The 620-megawatt plant is being built to produce energy primarily using natural gas. Santostefano said workers for the construction company, O&G Industries, were purging the gas lines when the explosion occurred. Kleen Energy Systems began construction on the power plant in February 2008. It had signed a capacity deal with Connecticut Light and Power for the electricity produced by the plant. Construction was scheduled to be completed by mid-2010.